A building fire is dynamic. A continually changing hostile fire environment influences time relationships that affect fire defenses and risks to people and building functions. The fire and fire defenses in each building interact with different sequences and distinct ways. Risks are characterized by the building’s performance. Fire Performance Analysis for Buildings, 2nd Edition organizes the complex interactions into an analytical framework to evaluate any building - at any location - built under any regulatory jurisdiction or era. Systematic, logical procedures evaluate individual component behavior and integrate results to understand holistic performance. The Interactive Performance Information (IPI) chart structures complex time-related interactions among the fire, fire defenses, and associated risks. Quantification uses state-of-the-art deterministic methods of fire safety engineering and fire science. Managing uncertainty is specifically addressed. Emphasizes fire performance analysis for new or existing buildings. Augments fire dynamics calculation methods with qualitative methods to form a more complete understanding of the effects of hostile fire characteristics on building performance. Describes fire ground operations for engineers with no fire service experience. An analysis evaluates ways the site and building design help or hinder manual fire suppression. Establishes a transition from traditional structural requirements to modern calculation based structural analysis and design for fire conditions. Structural concepts are described for non-structural engineers to enable the roles of each profession to be integrated into comprehensive performance evaluations. Addresses techniques of managing uncertainty to improve understanding and communication with professionals of other disciplines. Describes methods of risk management using information from the building’s performance analysis. 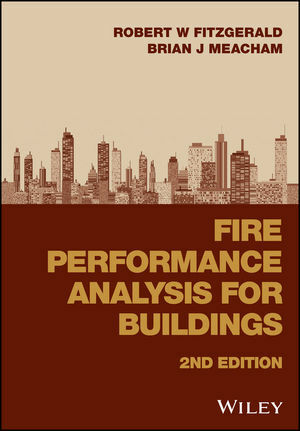 Fire Performance Analysis for Buildings, 2nd Edition has been completely restructured around a performance based framework. Applications integrate traditional fire defenses with fire science and engineering to combine component performance with holistic performance.